>The beauty of our country's present system of government is that anyone is perfectly free to buy a member of Congress. Isn't that what democracy is all about? Take the Koch brothers. Of course, these multibillionaire industrialists prefer to buy everything in bulk, and they've spent millions of dollars to purchase a whole flock of Republican Congress critters. How have the brothers responded? By buying another senator. In fact, they've spent so much on so many elections (from Congress all the way down to school board races) that they've made themselves the poster boys of Big Money corruption. By huge margins, polls indicate that the public wants Congress to terminate the infestation of our democratic system by the Kochs and other plutocrats. Don Nickles, an Oklahoma Republican, became a powerhouse Washington lobbyist shortly after he left the Senate in 2005. His lobby shop pulls in some $8 million a year to run favor-seeking chores for the likes of AT&T, ExxonMobil, FedEx, General Motors, and Walmart. Now, Nickles is pulling the Koch's plow. He's using his Capitol Hill contacts to try to defeat reforms that would shut off the gusher of secret, unlimited amounts of corporate cash that the Koch network funnels into our elections. What we have here is a perfect example of Big Money looping full circle to strangle the people's right to self-govern. 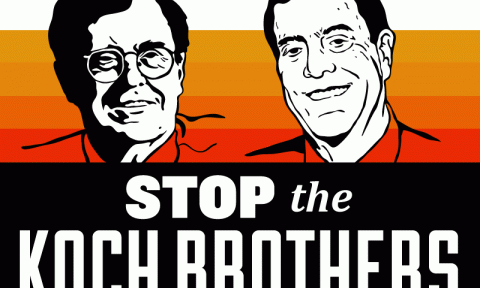 The Koch boys write huge checks to candidates and front groups to elect lawmakers who serve their interests. Some of those lawmakers, like Nickles, later slide into lucrative lobbying slots, getting paid a bundle by Koch & Co. to fend off anti-corruption reforms. Thus, the Kochs can keep making bulk purchases of lawmakers...and the circle is drawn ever-tighter around democracy's neck. To help pass a Constitutional amendment to ban this corrupt money, go to www.united4thepeople.org. Jim Hightower is an American populist, spreading his message of democratic hope via national radio commentaries, columns, books, his award-winning monthly newsletter (The Hightower Lowdown) and barnstorming tours all across America. The Trans-Pacific Partnership is not about free trade. It's a corporate coup d'etat -- against us!